Though she was not a pacifist, Emma Goldman insisted on the anarchist principle that the state has no right to make war. She believed that most modern wars were fought on behalf of capitalists at the expense of the working class, and that the draft was a form of illegitimate coercion. As the United States appeared to be drifting toward war in late 1916, Goldman threw her energy into opposing the government's military preparations, using her magazine, Mother Earth, as a forum. Goldman was not alone in this cause: the antiwar effort was the product of a broad coalition of liberals, socialists, anarchists, and progressive unionists. Ultimately, however, the federal government crushed this movement and repressed its elements in an almost hysterical patriotic prowar and antiradical crusade orchestrated by President Woodrow Wilson. 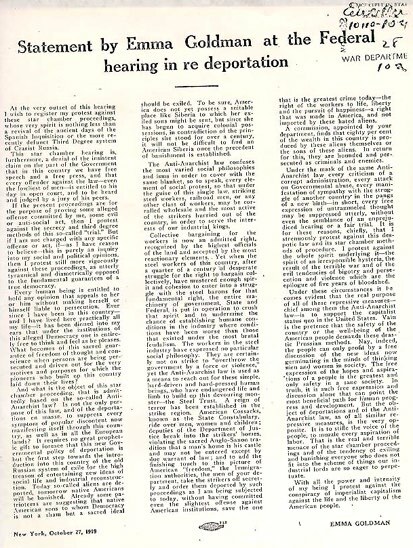 Mother Earth was banned, along with other periodicals opposing the war. Hundreds of foreign-born radicals were deported. Although Goldman knew federal government officials had been looking for grounds to deport her for years, she pressed on with her antiwar activities. Within weeks of America's entry into World War I, she helped launch the No- Conscription League to encourage conscientious objectors and spoke repeatedly against the draft, attracting eight thousand people to one meeting. Predictably, the government responded, arresting Emma Goldman and her comrade Alexander Berkman on June 15, 1917. Charged with conspiring against the draft, they were convicted and sentenced to two years in prison with the possibility of deportation at the end of their term. After an unsuccessful appeal to the Supreme Court, Goldman began serving her term at the Missouri State Penitentiary in Jefferson City. On September 27, 1919, Emma was released, only to be re-arrested shortly afterward by the young J. Edgar Hoover, head of the Justice Department's General Intelligence Division. Hoover advanced his career by implementing to the fullest extent possible the government's plan to deport all foreign-born radicals. 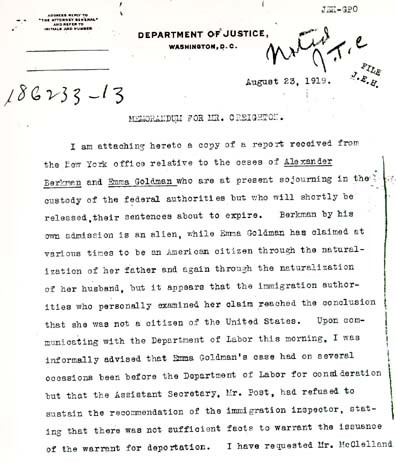 Writing the briefs and presenting the case against Goldman himself, Hoover persuaded the courts to deny Goldman's citizenship claims and to deport her. On December 21, 1919, Goldman, Berkman, and over two hundred other foreign- born radicals were herded aboard the Buford and, accompanied by a fearsome block of nearly one hundred guards, set sail for the Soviet Union. 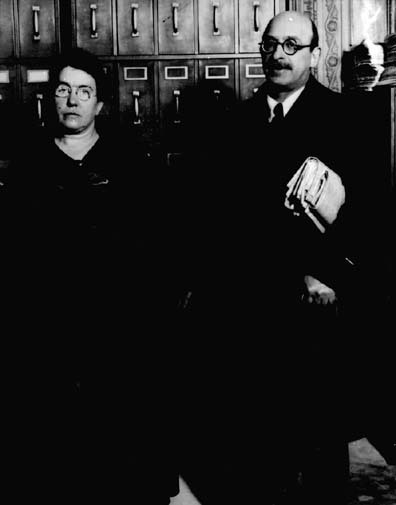 Emma Goldman and Alexander Berkman in New York, 1917, awaiting trial on charges of opposing the draft during World War I. In late 1919, following a period of labor turbulence and several bombing incidents, post-World War I antiradical hysteria reached fever pitch. In November 1919, Attorney General A. Mitchell Palmer launched a series of raids targeting the most vulnerable radical and progressive organizations. By early 1920, more than five thousand people were arrested in what became known as the "Palmer Raids." 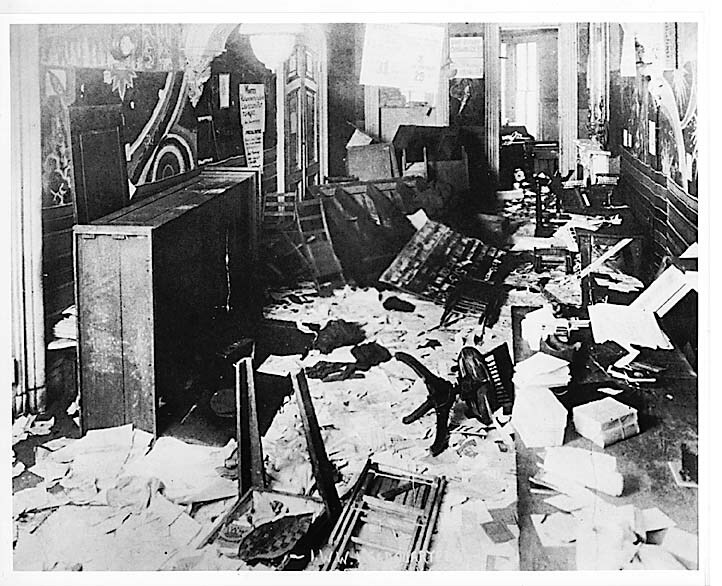 Goldman's Mother Earth office was among the first to be ransacked in 1917. Rumor has it that J. Edgar Hoover used her confiscated library and manuscripts to educate himself on the radical Left. Apparently, most of the material was later destroyed. In this, one of the most eloquent statements of her life, Emma Goldman castigated the "star chamber" proceedings of the American judiciary. Emma also lamented the increasingly repressive climate in the United States which she believed made the country indistinguishable from Czarist Russia. She attributed this repression and intolerance to an alliance of powerful industrialists and officials of state and federal governments. Goldman's statement included a scathing critique of the Anti-Anarchist laws, asserting that "the free expression of the hopes and aspirations of a people is the greatest and only safety in a sane society." 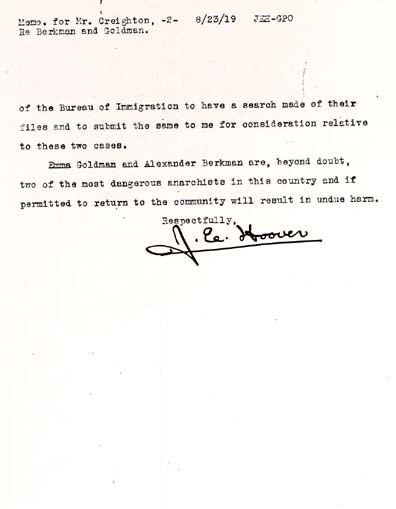 J. Edgar Hoover turned the deportation of Emma Goldman and Alexander Berkman into a personal crusade. In this letter he brands them as "beyond doubt, two of the most dangerous anarchists in this country." As special assistant to Attorney General A. Mitchell Palmer, Hoover amassed evidence against Goldman and Berkman and presented the case against them at their deportation hearing. Hoover was also present at 5:00 a.m. on the morning of December 21, 1919, when theBuford set sail for Russia carrying Goldman, Berkman, and the other deportees. Hoover and the FBI monitored Goldman's activities closely for the remainder of her life in exile from the United States. 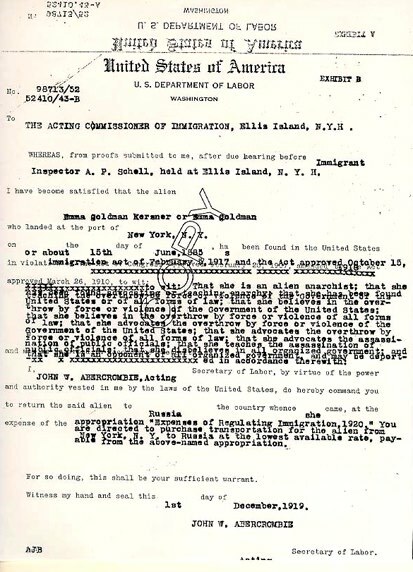 A copy of the warrant ordering Emma Goldman's deportation for advocating anarchism. 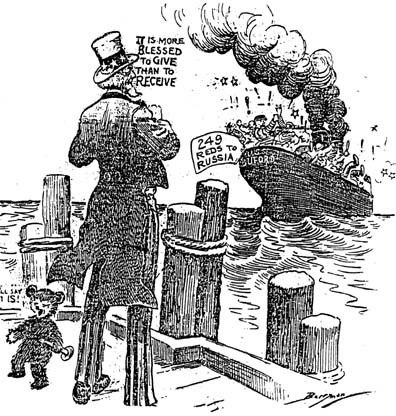 A popular antiradical cartoon celebrating the deportation of Emma Goldman, Alexander Berkman, and 247 other foreign-born radicals to Russia on December 21, 1919, aboard the Buford.